The monthly Bank of America Fund Managers Survey (FMS) is perhaps best known for exposing Wall Street's cognitive dissonance, if not schizophrenia, to the world because while on one hand survey respondents cry over soaring corporate and global leverage, at the same time they rush to 5x oversubscribe Italian 30Y bonds (using other people's money of course) despite knowing it will all end in tears. However, while generally perceived as a novelty sentiment index to be faded, with little information value, the monthly survey does provide some useful indicators of herd sentiment, two of which have been especially notable in recent years, namely what is the "biggest tail risk" for the market, and what is "the most crowded trade" at any moment. Of note, there were no major surprises in the February edition of the FMS - which polled 173 participants with $515BN in AUM - when it comes to what Wall Street saw as the biggest tail risk this month. As a reminder, the dominant concerns of investors since 2011 have been Eurozone debt & potential breakdown; Chinese growth; populism, quantitative tightening & trade wars. 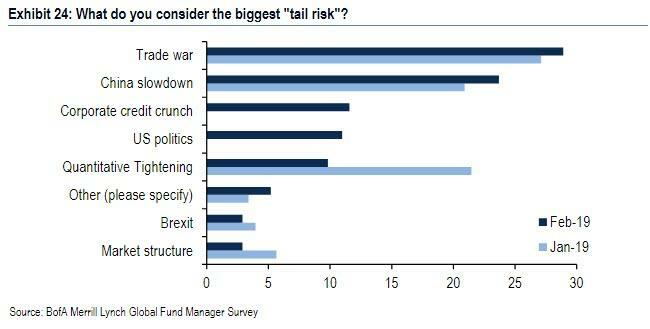 And, in February, it was more of the same as trade war concerns rose slightly and remain the biggest "tail risk" for FMS investors (11 of past 12 months), but concerns are substantially below the peak seen in Jul'18. What is most notable about this series is that whereas last month Quantitative Tightening was the 2nd biggest "tail risk" fear, following the Fed's dovish reversal, almost nobody is worried about the Fed suddenly pulling the rug from under the market. 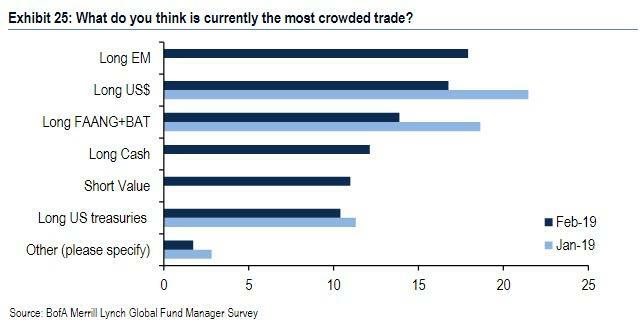 Where there was a surprise this month, was in what investors saw as the "most crowded traded." 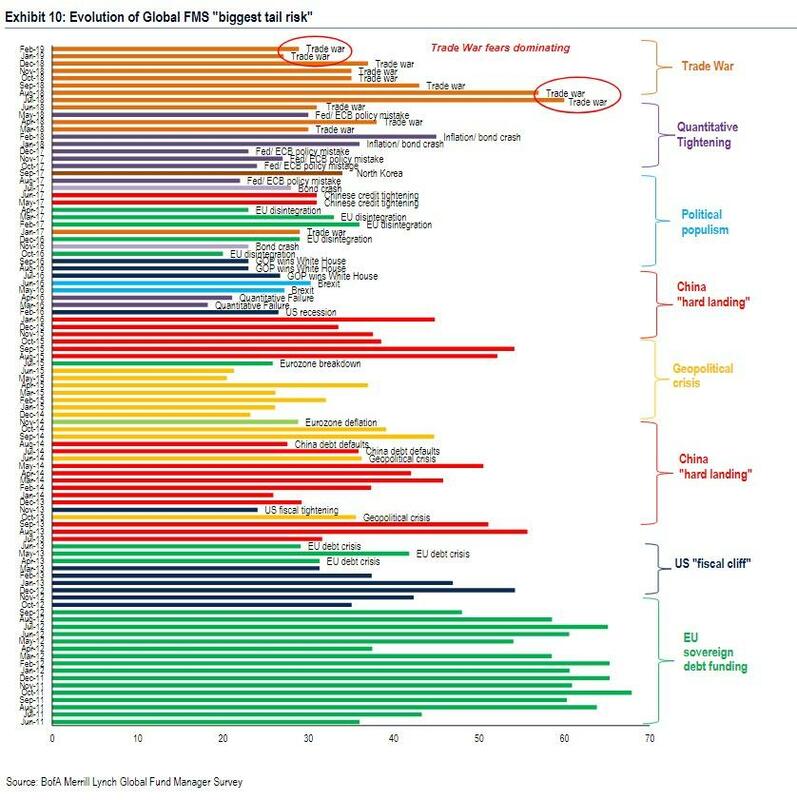 Also of note, as BofA highlights, the conviction on this particular crowded trade is the lowest on record, which makes sense as it is a function of Fed posturing, and is ultimately self-defeating - should EMs rise too high, the Fed will have no choice but to turn hawkish once again, in the process crushing the long EM trade and unleashing its "short EM" mirror image. While there is little practical value to the above data, it does confirm that the easy money from rotating into EM has been made as virtually all marginal dollars have already swung into EMs and from this point onward, a continuation of the Long EM trade will require thesis capitulation by bears to move the needle substantially, making further gains challenging. 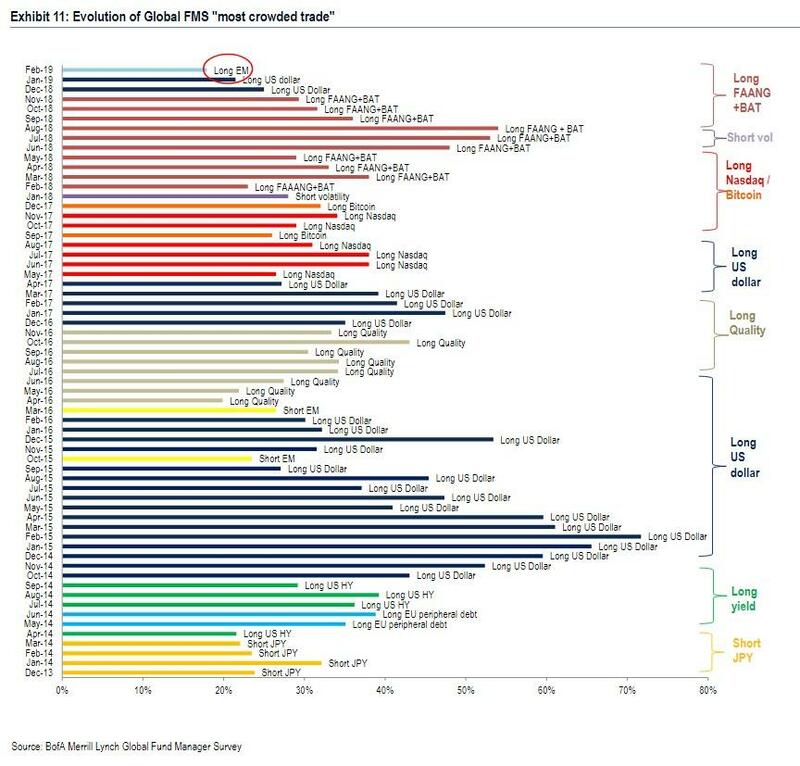 On the other hand, one could have said the same about the "Long FAANG/BAT" trade in early 2018 which however continued to be the most popular trade for nearly a year before suffering a painful implosion in late 2018.